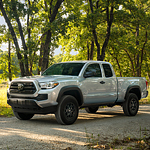 We at Toyota Of Plano will be able to help you pick out the perfect truck for your needs, but you should still have an idea of what kind of truck cab you want. Here's a quick guide that you can check out. Standard cabs are small, with two doors and one row of seating. The trade-off is that they come with larger beds, making the trucks great for hauling. These are larger cabs with two full-size doors and two smaller suicide doors. They have greater leg room than standard cabs, but the trucks have smaller beds than those on standard cabs. Crew cabs or double cabs have four full-size doors, making them essentially sedans with truck beds. They offer the most room for yourself and your passengers. They are very comfortable, even if the larger cabs mean smaller beds.